(24) Comments...What do you think? I’m really dying to know — why the Hassy? Obviously, the MF has all sorts of advantages when it’s used to full effect, but if you have to shoot with a wide lens and crop down, don’t you lose some of those advantages vs. just using something like a fast FF camera and a tighter lens (with near-instant response times)? The uber-flash setup still looks like fun, though. Hello Yuri, amazing shoot, I’m your best fan from colombia. Well…the first thing that I thought is that this is an unnecessary stunt. Air to air photos could be aesthetically more pleasing…or air to air with flash! Now, wouldn’t that be interesting. The flash units appear to be ProFoto, and if that’s the case, the flash duration is really short because the final photo is SHARP! 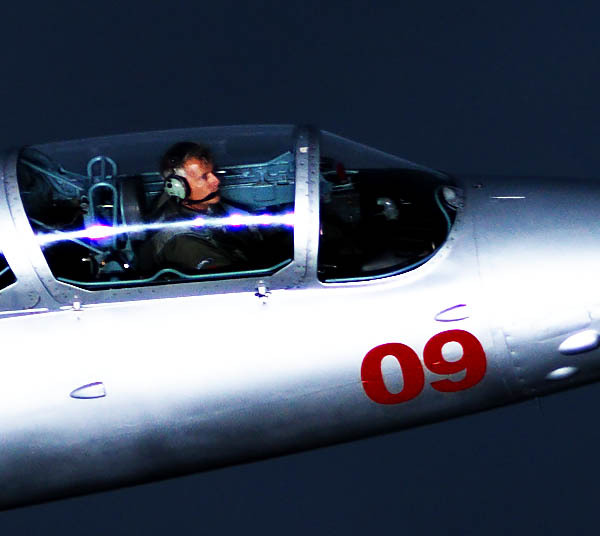 In retrospect, stunt or no stunt, it should be clear that Yuri is the only photographer in the world with a shot like this…and the jet looks terrific against the darkened clouds in the sky! Bravo! Pretty sure he went with the hassy to get the fast flash sync speed. Canon and Nikon are limited to 1/200 to 1/250 of a second. Where as the hassy will 1/800th. Agree its a great PR Stunt! Very spectacular! But using a 1Dx or so would have probably being more effective. Excellent video, very nice covered all the action. What was the ISO used? I have done this with the Harrier and a Cezna twin engined plane, way back in the 90s and with film. The MF is a must simply because of the flash duration, freezing the planes in action. However on a bright sunny day, way up in the air shooting planes, the natural clear light high up is unbeatable. Flash do create harsh shadows etc. Congrats! Yuri, your admirer from Cape Town. As always your work is stunning. Your believe in success, it is in your laughter. That shoot was awesome. Hello Yuri, amazing shoot, I’m your best fan from Indonesia. Surprised you only started panning towards the end. Maybe talking to a sports photographer beforehand would have been an advantage. Agree. Must have been fun for you! At 1/200 to 1/250 sync speeds. Actually no. Best choice is hasselblad if you can handle the shutter delay. As with most of forum posts, people often miss the point. To me the point was clear: CAN WE LIGHT A PLANE WITH FLASH? Then, OK, if we can, let’s do it. That’s enough reason. Aesthetics seemed to not be the main issue here. It’s more science and fun than serious art. I really dig this experiment. Now, how about speed-boats at night in the ocean? Thanks! Yuri, keep up ! I’m w D. Lambert… Use a FF 35mm digi w a longer lens… press, click.. or use a trigger system to determine where the plane is… 1 sec delay??? OMG..